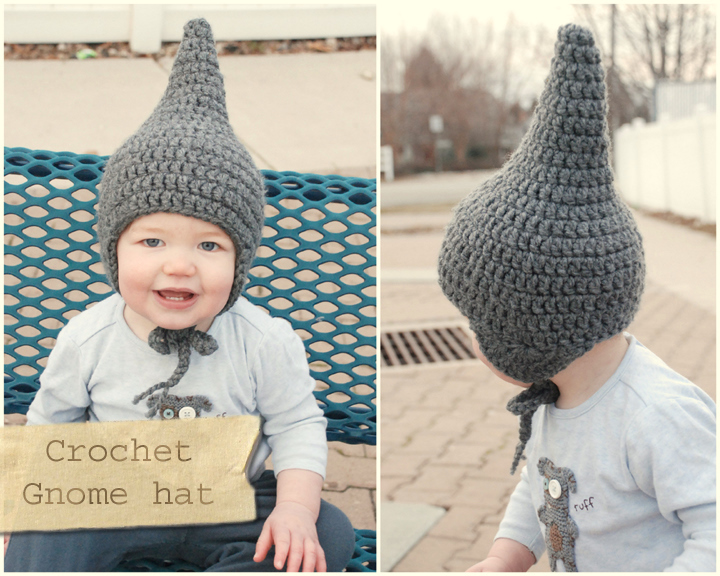 Hello everyone, I am here to introduce my newest friend. She doesn't have a name yet though. 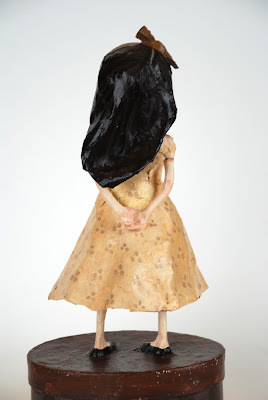 She is the first papier mache sculpture I have done with my newly acquired Paper Clay! 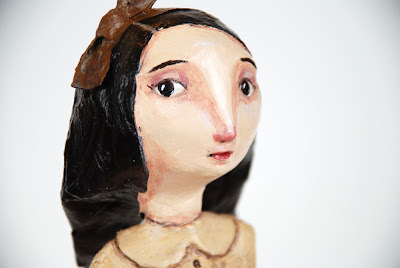 Lately I had become interested in making dolls out of Sculpey. 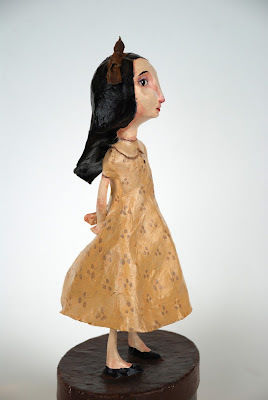 I loved looking at the beautiful art doll creations of Black Eyed Suzie, Du buh du designs, Noodle and Lou studio, and Marmee Craft no patience...OK both. I couldn't get the polymer clay to do what I wanted and I couldn't get the details small enough. I got very frustrated and gave up; but not totally. 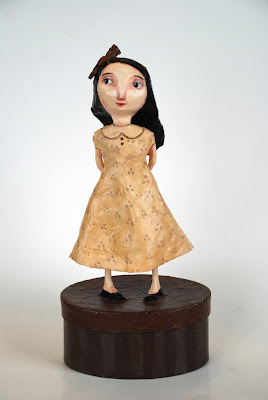 Since I love working with papier mache I thought working with paper clay would be a good experiment. 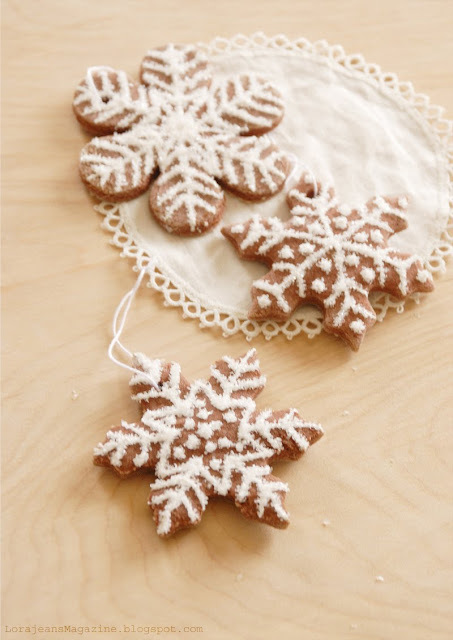 Plus it goes well with papier mache since it is, after all, paper. Paper clay is so much better for me than sculpey! It air dries, which I love (no burning) and after it's dry you can still add clay. Water can also be added to change the consistency of it. The experiment worked out really well and this pretty little girl is the result. I LOVE how she turned out. In fact I love her so much I'm afraid I cannot sell her. If I can get this great of results with the next girl then I may sell this one but you'll have. They inspired me to try my hand at sculpey, but sadly I have no skills at doll making, or I have to bribe me. I have three more girls in the works, with paper clay/papier mache, so be on the look out for more pretties! Let's hope they all turn out as cute and sweet as this girl did. 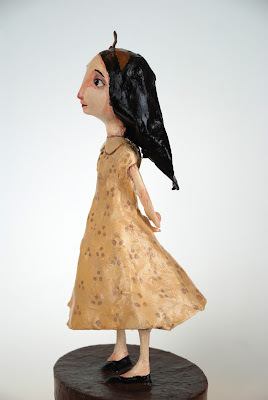 Her dress and hair are papier mache; and her face, arms, and legs are paper clay. Your images aren't working. I want to see your lovely creations!! Thanks Ali J for the info on my photos. They must have been broken links or something. I re-uploaded them and it looks like that fixed it. Enjoy. She's stunning! Oh my, she takes my breath away! Your girl is lovely and she makes me think of Diana, Anne's friend in Anne of Green Gables. I think the element are perfect. Don't ever switch mediums to plastic clays! The feeling of the paper is fragile and warm and like Paper dolls like we made as kids come to life!! LJ I think you have really found your medium here. This is beautiful! It's so fun to see my little sis come in to her own art wise. Way to go! Thanks everyone for all your nice comments. I am really happy to have crated something so beautiful. I'm glad to have found my medium.